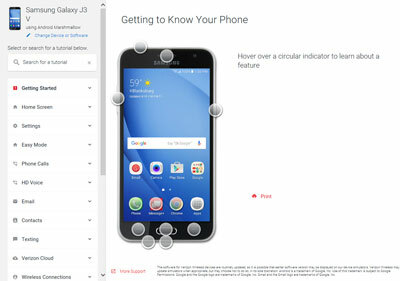 Get to know your new Galaxy J3 V with this quick reference guide. Get the most out of your battery by learning power saving tips on your Samsung Galaxy J3 V from Verizon. Learn how to use the Ultra Power Saving Mode to extend your battery life on your Samsung Galaxy J3 V from Verizon. Learn how to pair your Samsung Galaxy J3 V with a Bluetooth device and connect to a Wi-Fi network. Learn how to call and message using Bluetooth and contacts on your Samsung Galaxy J3 V from Verizon. Explore fun camera settings on your Samsung Galaxy J3 V from Verizon. Learn the basics of taking, sharing and storing photos and videos with the camera on your Samsung Galaxy J3 V.
Learn how to record a video using your Samsung Galaxy J3 V.
An interactive guide for setting your Samsung Galaxy J3 V to Airplane mode. Learn how to set up email quickly and efficiently on your Samsung Galaxy J3 V from Verizon. Learn how to forward an email on your Samsung Galaxy J3 V.
Add apps and widgets to your home screen. Customize your wallpaper. Learn how on your Samsung Galaxy J3 V.
Browse the web on the go with Google Chrome on your Samsung Galaxy J3 V.
Increase the security of your phone. This video shows how to set a lock on your Samsung Galaxy J3 V from Verizon. Tour your Samsung Galaxy J3 V, including unlocking the phone, viewing the notifications panel, tips on apps and more. Learn to use Easy Mode for a simpler experience on your Samsung Galaxy J3 V from Verizon.